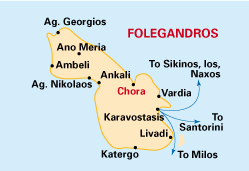 Folegandros has one of the most beautiful choras in Greece. Perched on sheer 700ft cliffs, the views are amazing and the air-conditioning is entirely nature-powered. A sequence of squares lead one into another like the rooms of an open-air palace. 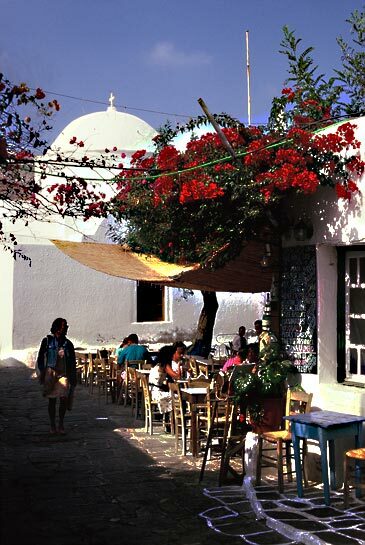 Here evenings become quite lively round the many bars, tavernas, boutiques and village shops. A few steps away is the old Castro district where rows of sparkling white houses line narrow streets, all surrounded by the walls of the castle itself. The chora is effectively traffic-free. There are good beaches and good walks on the island. 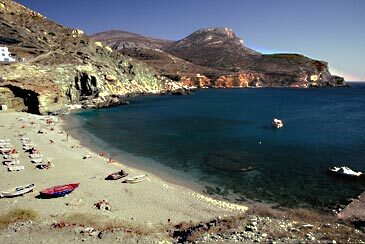 The most popular beach is Ankali (partly because it’s the only one with a reliable taverna) which is the first of a handful on the sheltered south coast – cliff paths and (in season) a caique-shuttle will get you to them. To reach Ankali you take the local bus to the top of a vertiginously steep path; don’t dread the climb back - there are donkeys for hire. There are other beaches – one skirts the arrival harbour of Karavostasis and is thus easy to reach by bus without needing a donkey back and further south is Levadi beach and beyond that – for the keen cliff-scrambler – is Katergo, with its private offshore islet. The bus runs north to several little villages culminating in Ano Meria (“Upper Parts”). 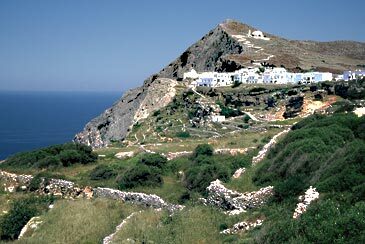 From these villages set in rolling agricultural terrain some 1000ft above the sea, tracks lead down to many small bays, some sandy, dotted round the extremity of the island. 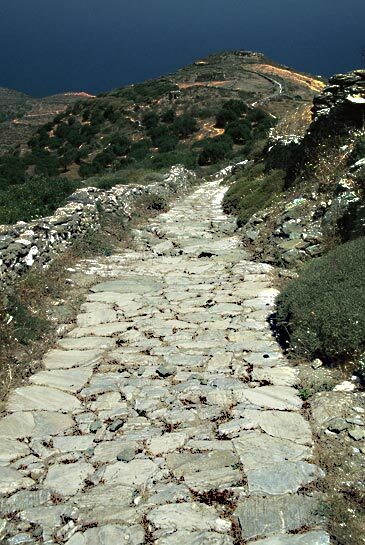 Many of the tracks are old mule paths, often with their stone paving still visible – and usable, even if you are not a mule. 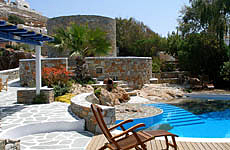 This is wild, utterly Greek country, with no beach tavernas – just magical tranquillity, fresh air and wonderful views across the sea to the surrounding islands of Milos, Kimolos, Sifnos, Sikinos, Paros and Naxos; but don’t assume you can take a day trip to any of those except perhaps Sikinos. This has always been the place to stay - an airy cluster of 16 beautifully designed, spacious, open plan studios, with fully equipped kitchens; and one suite with bedroom, living room and kitchen. 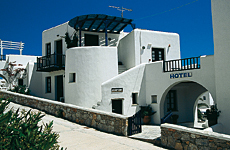 Built like a Cycladic village, it perches on the cliff edge beside the Pergola where breakfast (included) or an evening drink is served beside the circular pool. Port transfers incl. Cat.B. Air-con, phone, sat-TV, hairdryer. SCB. Perfect for those on a tighter budget. The Meltemi is across the street from the Anemomilos Apartments and has spacious split-level rooms (sofa in lower part, twin beds in upper part) with excellent bathrooms. Village views and some sea-glimpses. Air-con, fridge, TV, balc. RO.